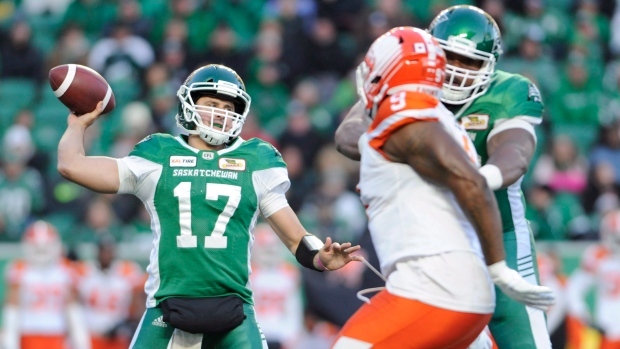 Zach Collaros will be the Saskatchewan Roughriders’ number one quarterback next season, GM Jeremy O’Day told reporters at a press conference on Wednesday. Collaros signed a one-year contract with the team on Tuesday. O’Day said Collaros will be in the number one spot for training camp. He wouldn’t give any more information on his other plans, including whether or not the team plans to go after Kevin Glenn. Collaros said he enjoyed playing in Saskatchewan and says he’s feeling healthy. He didn’t play in the Riders Western Semi-Final after taking a hit to the head in the last regular-season game of the 2018 season. He also said his love for new head coach Craig Dickenson drew him back to the team. Dickenson took over for head coach and GM Chris Jones, who left the team to pursue an opportunity with the Cleveland Browns. The Riders also picked up defensive lineman Micah Johnson on the first day of CFL free agency. Johnson had a lot of calls, he said Wednesday, but he felt the Riders respected his talent the most. O’Day also addressed the Riders losing Willie Jefferson to the Winnipeg Blue Bombers. He said the team made him an offer, but he knew he would likely move on to another organization.